Chronicles of a Foodie: Reptar Bars! "Reptar Bar, Reptar Bar, the candy bar supreme. The candy bar that turns your tongue G-R-E-E-E-E-N!" I am a child of the 90's. I was raised on the best cartoons...aka Nicktoons! One of my absolute favorite shows growing up was Rugrats, which inspired today's recipe: REPTAR BARS! To achieve your childhood dream, you'll need the following: Chocolate Chips, Marshmallow Fluff, Green Food Coloring, some sort of mold or pan, and then whatever filling you want inside your chocolate bar. As you can see I used a chocolate bar mold that I got off Amazon, but you can use a mini loaf pan, cookie cutter, or whatever you want your Reptar Bar to be shaped as! Our fellow foodie Lili isn't a fan on the original recipe that had caramel and nuts so I substituted in Golden Grahams, which made this bar taste like a portable s'mores! Melt up your chocolate chips and let's get to Reptar Bar makin'! Mmmm. Look at that chocolatey goodness. Minor but important note, chocolate chips and chocolate in general, has an easy tendency to burn, so watch your chips! Be patient and melt them slowly in a microwave safe bowl at 70% power in 15 second intervals. Be sure to stir between heat times, chocolate chips like to stay in their cute little shapes but make sure those suckers melt up so you can have the best Reptar Bar possible! 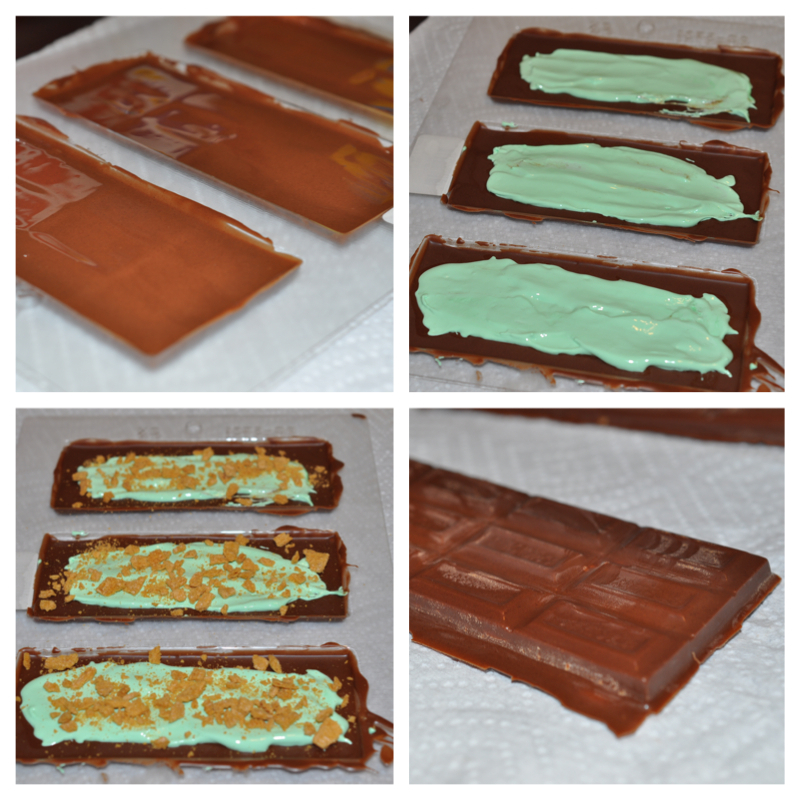 Add your melted chocolate to your mold and then stick it in the freezer while you get your marshmallow fluff warmed and dyed that oh-so-lovely green! Stick some marshmallow fluff in a microwave safe bowl and microwave at 100% for 15 seconds. You just want to heat up the fluff a bit so it's easier to work with and dye. You might think you won't need that much green, but you will. I wish I would have made mine a bit of a darker tint. Grab your set chocolate from the freezer for layer two of these Reptar Bars! Spread some green fluff on your chocolate but leave room around the fluff, a chocolate border if you will. This will ensure the fluff doesn't spread everywhere when you add your last chocolate layer. At this point, while the fluff is still sticky add your crushed up Golden Grahams to the bar. Press those suckers down so they stick all up in that fluff. After you've added all your favorite filling goodness stick it in the freezer again to set. You might have to reheat your chocolate chips again if it's not as melty as it should be. After about a minute or so grab your set bars and add the final chocolate layer and yes, you guessed it, stick it back in the freezer. This time, leave it in there for a good 15-30 minutes. The longer the better in my case since I had to pop my chocolate bars out of their mold. If you're patient enough and let your Reptar Bars freeze up you'll end up with something like this! These were definitely delicious and got the seal of a approval from Lili, my little brothers and my stepdad! 1) Melt your chocolate at 70% power at 15 second intervals. Stir between heating times. Be careful not to burn the chocolate! 2) Add your chocolate to your mold/pan. Reserve half the chocolate for the last layer of the Reptar Bar. Place mold/pan into the freezer to set. 3) Heat up your marshmallow fluff for 15 seconds. Add green food coloring until your desired green is achieved. 4) Remove chocolate from freezer and add your marshmallow layer to the chocolate but leave a border around the marshmallow to ensure your marshmallow stays in place. Add your Golden Graham crumbs or any other desired filling at this point. Place mold/pan back in the freezer. 5) If necessary, reheat your chocolate while your layers set. Remove mold/pan from freezer and add your final layer of chocolate. Return to freezer for 15-30 minutes or until firm. 6) After your Reptar Bars are firm you can either enjoy them now or wrap them up in foil and freeze them for later. Rugrats!!!! I love it! I miss those kids, my favorite was Susie. She reminded me of me. Oh. My. Goodness. Visiting from SITS and you ma'am are a genius! My kids are OBSESSED with Rugrats right now (because I, too, am a girl of the 90s and I made them that way). They will love these!!!! Visiting from SITS, these look delicious!! I loved Rugrats and those look amazing! Happy SITS Day! I never really got into that show. I think I was too old and then my kids were too young. I could get into those chocolate bars though. They look yummy! Do they turn your tongue green?? Another great recipe! Thanks for sharing, and Happy SITS day! So cute and delicious! So exciting that Rugrats are on TV again and that we can eat these yummy Reptar Bars while we watch! Making chocolates for the eating at bars in the some small and normal size for the spreading to children at the nursery class are done. Chocolates that made the raptor bars and for the students these superior essay are so much easy as making chocolates for the crushed. Almost few months ago I was working in the factory where the very delicious things is making. I am also make this with boom essays reviews now I am making this in my home with my mom.